Many years ago, Swami took a small group to the forest in Bandipur, not far from the hill-station Ooty. The group consisted mostly of students, but a few elders also were there in the party. It was a lovely outing, one grand picnic with the Lord. The boys had their full - games, sightseeing, looking out for wild-life, and lots of goodies to eat. Only one thing remained - a photo with Bhagavan, a treasure, and something to remember this memorable event by. One of the members of the party had a Polaroid camera, and taking photos was therefore no problem. One by one the boys went, stood next to Swami, and had their picture taken. After everyone had been photographed, the boy who was doing the clicking prayed to Swami that He should pose for one picture all by Himself. Baba agreed, and the picture was duly clicked. The picture got instantly developed and was lovingly offered to Bhagavan who was sitting on a slab. Swami looked at the photo for a while - it was a beautiful picture - and then asked the boys, "Do you want to know who I am?" Everyone was now seated around Him on the ground; they did not know what to make of the question; so there was no response. After a while, Swami again asked, "Do you want to know who I am?" There was an unusual glow in His eyes, and there was also immense power in His voice. Everyone sensed that something extra-ordinary was about to happen and therefore did not dare to give any kind of a reply. 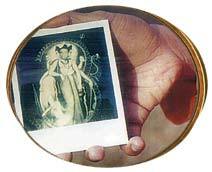 Swami then held up the photo He had in His hand so that everyone could see it. It showed the lovely picture of Swami. He then placed the photo face down and then started rubbing it against His thigh. At this juncture, one of the elder members of the party noticed that the lower edge of Baba's robe was a bit crumpled. Instinctively, the person leaned forward to straighten the robe, but Swami in an unusually harsh and commanding voice said, "Stay away; don't touch!" The devotee who tried to adjust the robe was taken aback by the severity of the tone and instantly withdrew. Swami continued rubbing the photo a few times more. He then slowly lifted it and held it up for all to see. What the gathering saw was not the picture of Swami; that beautiful picture had vanished. In its place was the majestic picture of Lord Dattatreya, who embodies the Divine Trinity [i.e., Brahma, the Creator, Vishnu, the Sustainer and Protector, and Maheshwara, the Dissolver of the Universe], complete with four dogs, representing the four Vedas. Baba then looked with compassion at the devotee to whom He had spoken harshly a little earlier and said, "I was charged with Divine Energy when I was revealing Myself as Dattatreya in the picture. It at that time you had come into contact with even My robe, you would instantly have been reduced to ashes. That is why I spoke sternly; it was entirely for your safety!" On another occasion, Baba explained that when Krishna as a young lad lifted the Mandaragiri mountain [to protect the villagers from downpour], He had advised all the villagers to remain indoors and not come out. Swami added that this warning was necessary. Krishna had to invoke enormous Divine Power for lifting the mountain, and if anyone had accidentally touched Him then, that person would have been reduced on the spot to ashes. Avatars are packed with Infinite Power. However, they rarely use it. If at all the Power is used, only a tiny portion of it is. And the use is always for the benefit of others. In this case, the demo helped to reinforce the devotion of those who had followed Baba to the forest.